On the first day of a recent trip to Berlin, I decided to take an organized tour to get an overview of that historic city before I tackled sightseeing on my own. Back in the days when Berlin was still a divided city, I knew the western sector fairly well. But I hadn't been back to Berlin since shortly after the reunification of East and West Germany in 1990. So a guided tour seemed the best way to get my bearings in that sprawling capital city of more than 3 million people. I had a choice of a walking tour with a guide, a group bicycle tour, or an excursion in a colorful, open-to-the-elements Velotaxi® , a new sight on the Berlin scene since my last visit there. But I was still suffering from jet lag, the weather was gray and misty, and I was feeling lazy, so I wimped out and opted for a "VideoBustour"—which sounded like the least adventurous activity I could choose, but one that suited my mood and the weather that day. 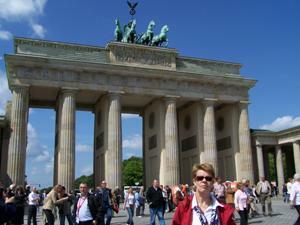 I soon discovered that this new concept in guided tours is an excellent way to see a city like Berlin. Unique in Europe, these VideoBustours are conducted on comfortable, modern buses fitted with flat-screen video monitors and state-of-the-art audio/video equipment, augmented by multilingual tour guides well versed in the history of the city. On the 2-1/2- to 3-hour tours, the bus stops at many major landmarks—the Brandenburg Gate, former Checkpoint Charlie, the Holocaust Memorial, Alexanderplatz, remaining sections of the old Berlin Wall—where documentary film clips, historic photos, archival sound recordings, and computer-generated images are played on the video screens while the guide narrates the footage and explains the links between past and present Berlin. You'll see what that same site looked like during the reign of Kaiser Wilhelm II, the Nazi era and World War II, the Cold War and the Communist period in East Berlin. Then you can look out the windows or get off the bus to see what that location looks like today. "Berlin is a city where buildings and history are vanishing," said Bobby Grampp, the English-speaking German historian who accompanied my tour. "Berlin is possibly the city that has changed the most during the 20th century, from the Third Reich and the bombings during the Second World War, to the reconstruction of the western sector after the war, the building of the Berlin Wall, and finally the fall of the Wall and all the new construction that has happened in the eastern sector after that." Since so much of "old Berlin" was destroyed in World War II, a VideoBustour is one of the best ways to get a sense of the city's rich architectural history. 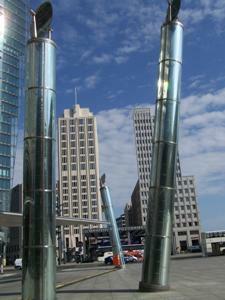 The tour that focuses on this aspect of Berlin is titled "Berlin—Images of the Metropolis." Film buffs will love another tour titled "Berlin—City of Films," which takes you to the locations where famous Berlin movies were shot and shows clips, on site, from films such as "The Lives of Others," "Good Bye Lenin," and many more. Recently the VideoBustour company expanded its program to the port city of Hamburg. Anyone interested in the history of Berlin or Hamburg will learn a lot from these well-organized and informative tours, whether you're a first-time visitor or a traveler already familiar with those cities. For information on English-language tours, bookings, standard tour topics, and special tours, contact www.videobustour.de (for Berlin) and www.jasper.de (for Hamburg). Click on the English-language translation for each website. Sharon Hudgins is a food and travel writer with more than 600 articles published in magazines and newspapers across the globe. She has lived in 10 countries on three continents and traveled in 45 countries around the world. She is the author of two award-winning books-a cookbook about the regional cuisines of Spain and a travel memoir (The Other Side of Russia) about her life in Siberia during the early period after the collapse of the Soviet Union.